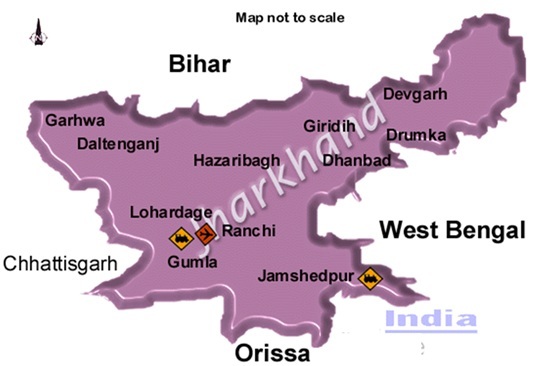 Jharkhand is a state in eastern India carved out of the southern part of Bihar on 15 November 2000.The state shares its border with the states of Bihar to the north, Uttar Pradesh and Chhattisgarh to the west, Odisha to the south, and West Bengal to the east. It has an area of 79,710 km2 (30,778 sq mi). The city of Ranchi is its capital while the industrial city of Jamshedpur is the largest in the state. It is the top producer of iron ore, copper ore, kainite, mica and uranium (Jaduguda mines, Narwa Pahar). Jharkhand is a state in eastern India carved out of the southern part of Bihar on 15 November 2000.The state shares its border with the states of Bihar to the north, Uttar Pradesh and Chhattisgarh to the west, Odisha to the south, and West Bengal to the east. It has an area of 79,710 km2 (30,778 sq mi). The city of Ranchi is its capital while the industrial city of Jamshedpur is the largest in the state. It is the top producer of iron ore, copper ore,kainite,mica and uranium (Jaduguda mines, Narwa Pahar).